Communities around New Mexico are showing off their all-American colors with activities, events, and festivities to celebrate America’s independence. Commemorate this great nation at any one of these celebrations and you’ll be treated to a spirited, star spangled display of patriotism. Wave a flag, sing our national anthem and honor this sweet land of liberty for the perfect Fourth of July in the Land of Enchantment! Balloon Fiesta Park, in the shadow of Sandia Peak, is host to this year’s free Independence Day celebration from 3 to 10 p.m. It’s a full day of entertainment. There is a lineup of different bands including the country star that’s headlining Jo Dee Messina. Also enjoy plenty of children’s activities throughout the day. The Microbrew Garden features a huge variety of local establishments and local food vendors will have everything from fried chicken and grilled burgers to snow cones and plenty more. Fireworks blast off at 9:15 p.m.
Get ready for some nostalgia at this classic celebration complete with parade, a picnic, live music in Brandenburg Park and a full day of activities for the family throughout the town. The parade, billed as the largest in northern New Mexico, begins promptly at 10 a.m. and is made up of decorated floats, equestrian units, car clubs, and vintage Jeeps. The annual July 4 Egg Toss and family-friendly games take place on the lawn of the Red River Community House. All activities of the day begin at 10 a.m. If you like fireworks then this is the place to be. The spectacular pyrotechnic show, which lights up the night sky and beautiful Lake Mescalero, is the biggest and longest in New Mexico. This day full of festivities begins at 3 p.m. with ticketed activities including rock climbing, an obstacle course, jumping balloons, and more. From 5 p.m. on there will live musical performances that go on until 9 p.m. 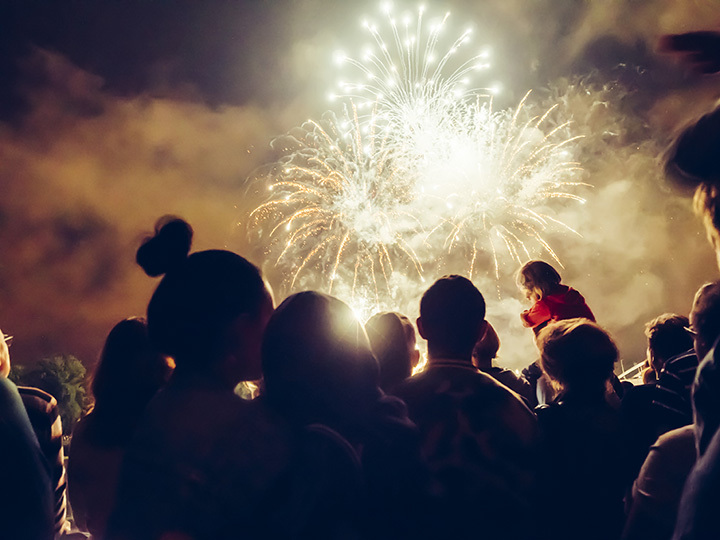 This event is geared towards family fun, and with this being the largest fireworks display in New Mexico, you and your people won’t want to miss it! The day’s festivities begin in the village of Arroyo Seco with the famous a parade starting at around noon. Get there early because you won’t want to miss a second of it! While that’s going on, up at Taos Mountain there’s a performance by Christof Brownell at the Stray Dog Cantina. At 2 p.m. there’s the annual parade on Sutton Place, Out of Nowhere plays at the Taos Ski Valley Main Plaza, and the Field Institute of Taos. Duck Races & Awards happen a bit closer to 3 p.m. There are also plenty of kids activities going on throughout the day. When it’s time to fuel up, there’s an assortment of local food vendors such as Pizza Shack, Bumps Market & Burrito Bar, 192 at The Blake, and plenty more. This event is a quirky assortment of locals that include families, farmers, horseback riders, extravagant parade floats, chairlifts, rubber duck races, and whatever other local free-spirits join in. This event, now in its 43rd year, takes place in the city’s historic plaza and continues to be a labor of love for the Rotary Clubs of Santa Fe which donate the proceeds to local nonprofits. Of course, there are hot-off-the-griddle pancakes to be eaten, as well as cool cars to admire, a unique art show to wander through, kid’s games to play, arts and crafts vendors to shop at, and live music that gets your feet moving. Wander through town, drop into local businesses, hang out with family and friends and end the day looking up at the unforgettable fireworks show. Tickets are $8 in advance, $10 the day of. The Fourth of July celebration in the Four Corners region is a wonderful celebration of Independence Day that boasts a variety of events. The lead up to the big day begins with an Outdoor Summer Theater performance of Mary Poppins, the Broadway Musical on June 28, followed by the three-day San Juan County’s Gem and Mineral Society show at McGee Park Indoor Riding Arena, a TGIF luncheon sponsored by the Farmington Parks, Recreation and Cultural Affairs at Orchard Park, and then Piedra Vista High School volleyball team’s annual dawn to dusk co-ed tournament takes place at Brookside Park. On July 3 you can participate or watch the Hoops and Hotcakes from 5-8 p.m., and then at around 9:25 is when the beautiful fireworks display happens. Finally, on July 4 there’s a Party in the Park, Brookside Park that is. That entails a skateboarding competition, water balloon dodgeball, and a pizza eating contest. Brookside Park is the home base for entertainment, food vendors, petting zoo, live music, a skateboard competition and pizza eating contest. The grand finale is the Farmington Rotary Electric Light Parade held in the historic downtown. Whew! The town goes all out honoring the stars and stripes throughout the day. There’s a parade—it wouldn’t be a small-town celebration without one—that features the town’s most beloved citizen, Smokey. People line the streets whooping it up for parade participants in horse-drawn wagons, on horseback, on firetrucks, with pets and in military, antique and custom cars. Kick off the July 4 by taking part in the Smokey Bear 10K or two-mile fun run. The Stampede, the country’s largest open rodeo, is four days of traditional, women’s, youth and open ranch rodeo events, live musical performances, a barbecue cook-off and dinner, a dance and, after the last bull is ridden, a fireworks extravaganza. Begin the day at Gough Park at the annual Kiwanis pancake breakfast. After you’ve eaten your fill, wander over to the downtown section to watch the parade which snakes its way down Pope, Bullard, Broadway, Hudson and 12th Street. Head back to Gough Park for live music, food and art vendors and the Silver City Fireworks Show sponsored by First American Bank. Be sure to take some time to go to the Silver City Museum courtyard for the 35th Annual Ice Cream Social taking place from 11 a.m. to 4 p.m. Nothing like a root beer float to celebrate the day! This year the City of Las Cruces and New Mexico State University are collaborating on this spectacular fireworks show held at Pat and Lou Sisbarro Community Park. The live entertainment will be off the charts this year, with Jefferson Starship opening up for Dennis DeYoung. Before we get ahead of ourselves, on Tuesday the event really kicks off with the annual Electric 5K & One-mile Fun Run, followed by the Electric Light Parade with the theme “Illuminate the Sky.” Grab your brightest outfits and neon lights and participate in these energetic events. The festivities are topped off with a spectacular fireworks show at 9:45 on July 4. This year in Roswell your eyes will be so lit up with excitement that you won’t be able to contain yourself. If you want a spectacular show then head over to the Cielo Grande Recreation Area at 6 p.m. This year the free event has the Swon Brothers with the opening act Kristine Mirelle performing. The fireworks display goes on for a full 30 minutes and will be sure to put stars in your eyes. A motor train and Jolly Jumps inflatables as well as other activities will be sure to keep the little ones entertained. Food vendors will be present so come hungry! View more New Mexico July 4th Fireworks and Celebrations.